Home Blog Recipes, food & cooking 5 Ways with Pumpkin! Halloween is drawing near and the nights are drawing in, but what do you do with the juicy flesh of your pumpkin once it is hollowed out for display? We’ve gathered together 5 delicious recipes to tempt you into spicing up the humble pumpkin. Enjoy! We love the delicious fresh recipes cooked up by Diana in her Little Sunny Kitchen blog. 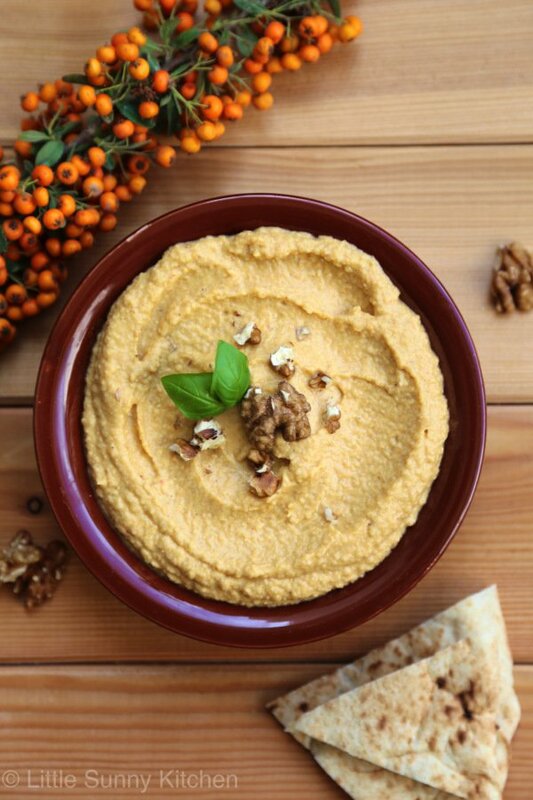 Recently she has been celebrating the return of autumn by creating different recipes using pumpkin and she’s kindly let us share her Pumpkin Hummus recipe. We think it will become a favourite! Garnish with walnuts or pine nuts, and olive oil. We have been supplying Weetons Food Hall in Harrogate for many years with spices and condiments. This year they have produced 10 new recipe cards to celebrate their 10th birthday and we think this soup sounds delicious! Try using different varieties of squashes or pumpkins to vary the final result. Heat oven to 200C/180C fan/gas 6. Cut the butternut squash into large chunks and toss with half the olive oil and honey in a roasting tray and season with sea salt and freshly ground black pepper. Roast for about 30 minutes, turning occasionally, until golden and soft. In a large saucepan melt the butter with the remaining olive oil and sweat off the onions, garlic, carrot, leek, herbs and chili over a low heat until soft and the onions are transparent. Add the roasted squash and stock to the pan, bring to the boil and simmer for 20 mins. Remove from the heat and process the soup through a liquidizer in batches for a really silky finish. Return to the pan and season to taste with the lime juice, sea salt and freshly ground black pepper. Gently heat the cream in a small sauce pan until nearly boiling, remove from the heat and crumble the goat’s cheese into pan and whisk until smooth. Serve the soup with some of the goats cheese cream drizzled over and a sprinkling of the sliced spring onions and a few drops of extra virgin olive oil. Pumpkin season wouldn’t be the same without a recipe for Pumpkin Pie. Here we have used our own blend of Pumpkin Pie Mix, a delicious organic blend of cinnamon, nutmeg, ginger & cloves that gives the perfect flavour to the traditional pumpkin pie. Preheat the oven to 200oC/ 400oF. Roll out the pastry and use it to line a 23cm round pie dish, to about 3mm thick. Blind bake the pastry case for about 10 minutes. Now mix up the filling. Whisk the eggs lightly in a bowl. Add the Fairtrade caster sugar, sea salt, Steenbergs Pumpkin Pie Spices, pumpkin purée and then evapourated milk. Give it a good whisk after each ingredient to ensure that it has been mixed through thoroughly. Reduce the oven temperature to 170oC/ 340oF. Take the part-baked pastry from the oven and pour in the filling. Bake for about 45 minutes, or until the filling has just set; if you insert a skewer into the centre of the pie filling, it should come out clean. Allow to cool completely, then serve with cream. If you’re feeling indulgent, how about adding a smidgeon of Jack Daniels to the pie (about 2tbsp). Chop up the pumpkin, removing all seeds and internal fibres, then place onto a baking tray and bake for 20 minutes at 180oC; now scrape out the cooked flesh and process until smooth. 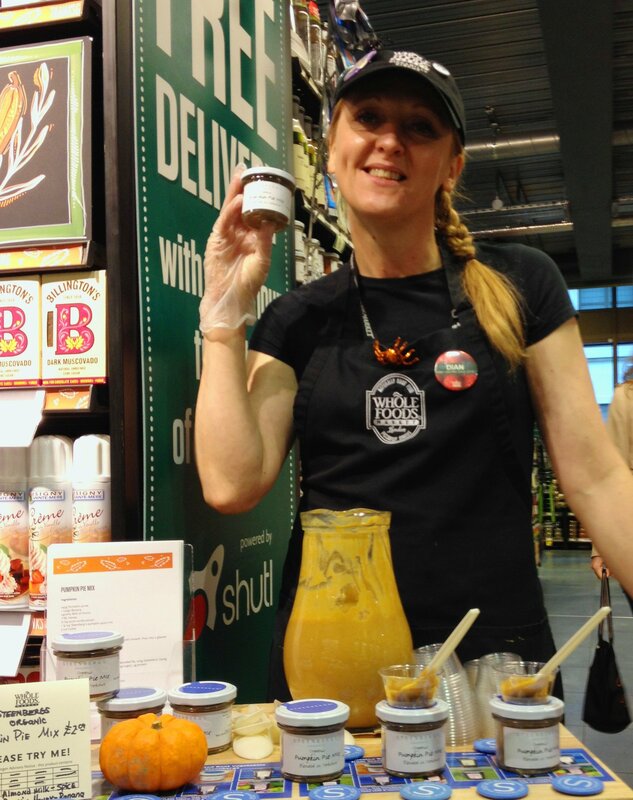 A longstanding stockist of Steenbergs spices and home baking ingredients, Whole Foods Market in London is great at creating new recipes to showcase their products. 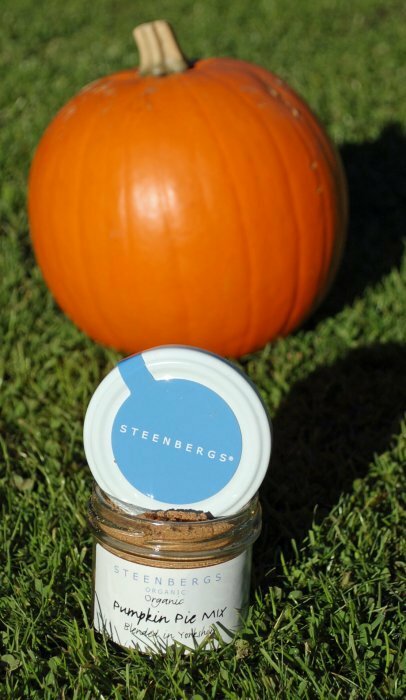 Here’s a deliciously creamy, dairy free smoothie they created using Steenbergs Pumpkin Pie Mix. 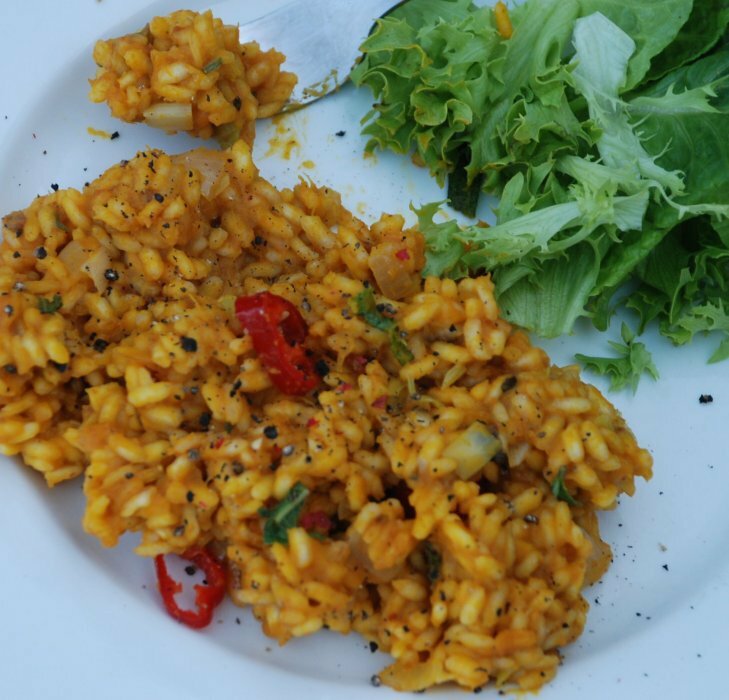 Finally a homely, savoury Steenbergs family risotto recipe which is perfect for cosy nights in. 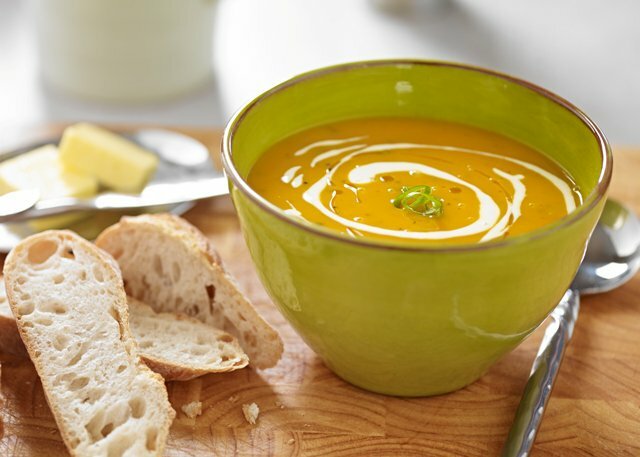 You can use fresh pumpkin purée as detailed above or, to make this at any time of year, our jars of pumpkin puree work a treat! Heat the stock and puree together in a saucepan. Add a ladel of hot stock and puree to the rice. Allow liquid to be absorbed before adding another ladel. Repeat until all stock used and rice in slightly tender but still has a little bite!